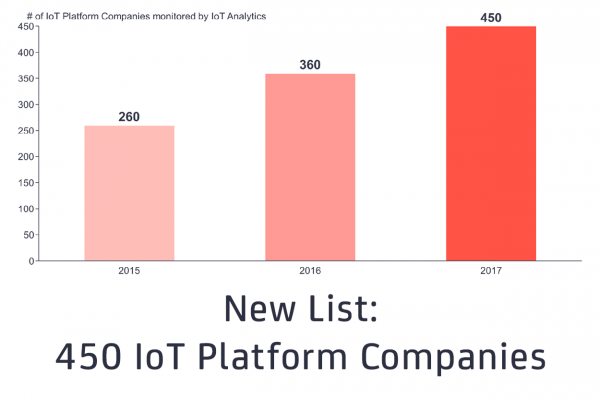 The 2017 list of IoT platform companies contains extensive information on 450 IoT platform vendors, including details on capabilities, revenue, key customers, as well as industry focus. Hamburg, Germany – June 27, 2017 // IoT Analytics, a leading provider of market insights and strategic business intelligence for Industry 4.0 and the Internet of Things (IoT), just released its current Global IoT Platform Companies List. 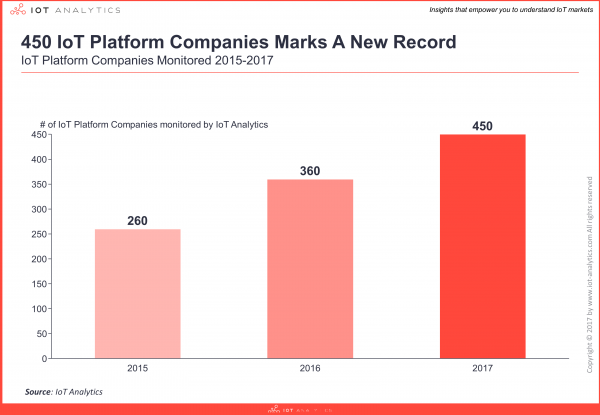 The comprehensive database now includes 450 IoT Platform companies worldwide which marks a 25% increase compared to the previous year. 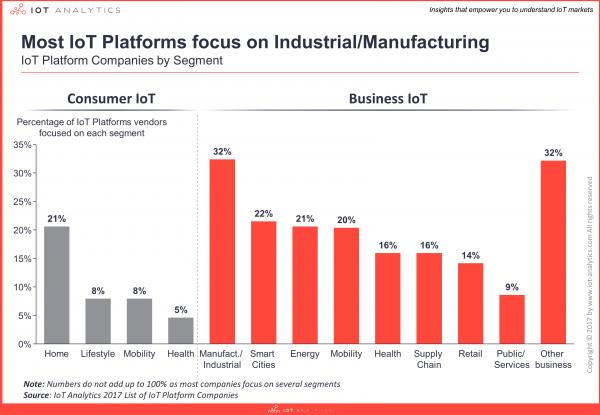 Commenting on the updated list, IoT Analytics Managing Director Knud Lasse Lueth said: “The market for IoT Platforms continues to get more crowded and fragmented. However, the dynamics are shifting: While we continue to witness a constant stream of new startups entering this space, most of the larger vendors seem to have made their bets by now – organic new entrants by multinationals are becoming rare”. The updated IoT Platform database itemizes the 450 market participants in greater detail across 50 sets of information. Segment insights: Of the 13 industries analysed, most of the vendors now focus on supporting IoT Solutions in Industrial/Manufacturing (32%), Smart City (21%) and Smart Home verticals (21%). In previous editions of the list, Smart Home had been the leading vertical. Regional insights: Even though platforms from 40 countries worldwide are represented, more than half of the firms in the list are headquartered in the US. Technology insight: The majority of platforms have a core focus on Application Enablement (92%). Only 3% of the platforms offer IoT specific cloud storage (IaaS). Market dynamics insights: More than 30 of the companies included in the 2016 edition of the list have ceased to exist. These companies have either gone out of business or have been acquired and are listed separately in the database. The 2017 List of 450 IoT Platform Companies is available for purchase HERE. A free sample is available. It’s very nice to read your article and thank you for your great effort. But i feel that there is no one best platform suitable for any IoT project. This choice will always depends on the specific project requirements of your business. Here is one more IoT platform which is “code-free” digital platform. C2M® (https://www.c2m.net) is Plasma’s code-free, end-to-end Internet of Things and Digital Enterprise platform allows easy, secure and rapid prototyping and deployment of IoT / M2M solutions.